I am going to preface this post by saying that I've never gone horse shopping before. Wilbur was in barn and I pretty much love anything with four legs- so that was a quick and easy deal with one (I know- in retrospect I was so dumb) ride before purchase. I'm actually really curious to hear about other bloggers horse shopping experiences! When I bought Wilbur I relied a lot on my trainer at the time- both her opinion on how he'd finished up and what it would take to finish him. Looking back, I think I was over horsed and he was really just too green. So in shopping for horse number 2 I'm finding myself in a similar quandary. How young is too young, how green is too green, am I going to end up with something I can ride and enjoy? And frankly after being "burned" the first time around how do I trust that Kelly is making the right call for me? Because I do think there is a lot of trust involved in dealing with young horses and amateur riders. I had quite a few friends, experienced horseladies (and Paul) express concern over Ellie. Primarily because, to be honest, we have not done an exhaustive search of the Bay to find the "perfect" horse. Kelly saw her posted, liked her, we went on a whirlwind horse shopping trip, and here she is on trial. Before we went on the trip I did take some time to examine what I wanted out of this new horse. My budget is such that I knew I was not making decisions on whether I wanted the grey or bay Hunter Derby horse. And inventory is very limited in California. The options are a younger horse with some potential or a teenage schoolmaster that likely needs regular maintenance. I am always going to lean towards a younger horse for two reasons. One: I don't want to be bored. A schoolmaster is great for some but I feel pretty confident in my ability to jump around a course and I like a bit of a challenge. Two: I feel a lot of pride when I see a greener horse win small victories. Like Wilbur at his first Sonoma show. Proud momma! Plus- when I'm paying for training I want to see it as an investment in learning versus just a tune up ride. I hopped on this guy for fun (and so Kelly could see for another client). A 25K, 12 yr old, 2'6" horse. He knows his job for sure! But what else is important? Well, as a working gal I sometimes need to ride a little later in the evenings. I feel a big difference in my comfort level riding Polly at night by myself than I did with Wilbur. Confidence that she won't have a meltdown in the cross ties and spook at everything in the ring. I need to feel comfortable riding by myself with this new horse. Tomorrow I will be having lesson on Polly at 4 then riding Ellie in the evening. A good test. I need a horse with the stride to get down the lines. Ben and I (at Sonoma Horse Park) tried the low (very low jumpers) and with his short stride I never felt confident that he was going to make it out of the in and outs. Needless to say I stuck to the Hunter Ring and added every line. Which was totally fine for what we were doing. But I want to do grids and lines knowing the horse can carry me through so that if we ever do end up showing we can be competitive. I'll be posting some video next week but we know that Ellie can trot in and canter out in the appropriate strides. Mostly I just want to have fun. Ambiguous right? I want a partnership, a horse that I trust and that trusts me. That I can take to a show, not for ribbons, but to be part of the scene and get out with my barn buddies and their horses. A horse that enjoys their job. And a horse that will grow with me. I'm curious to hear how other bloggers picked their perfect ponies! Do share! With Carlos he was a horse that was for sale with my trainer and I was a working student so it was my job to ride him and you know he didn't really have the stride without galloping, and I hated him a solid month when I rode but he grew on me like a fungus. He was plucky and hot and not easy and I loved it, She ended up just giving to me and it was the happiest moment of my life. Even at 14 with the bad navicular that he had (undiagnosed yet) he still challenged me and kept me on my toes. I'd do it all over again in a heart beat. Ramone I didn't even see a picture, it was an idea really. I've ridden with my trainer since I was a kid so I trust her, and she knows me, she knows what I can handle better then I can. She asked me at Brookside Premier if I got a second horse what would it be and I said large stride to make it down the lines, bay is the best color and tiny ears will always win me over (chock that up to all the pony jocking I did and Carlos really did have the tiniest ears). I guess its different these aren't trainers you grew up with, but I completely trust my trainers or one of her sisters to find me a horse whenever I need one. You and I must be horse shopping twins! Wow! Getting Ramone without even a pic- I love it! Well I didn't buy him until after a week trial and PPE. And my trainer did try to send me a picture of him but she is very not technology proficient, so I didn't get it until WAAAYYY after I bought him and frnkly I probably would have passed up a nice horse because he was rough looking in that picture, if I had seen it.! Yes! Ellie is totally adorable- but for some reason she is much cuter in person than in videos! I could go on and on... And on about my horse shopping trials and tribulations but my main statement is- don't settle. There is no reason to buy the first thing you find. It is much more worth it to wait and find the right horse then to rush it and jump into the wrong one. Houston kind of found me. I was actually tired of looking and coming off 2 failed pre purchases when I was talking to a trainer that said I should go visit this breeder in Indiana (for another horse they had). Houston was the opposite of what I thought I wanted. He was way too big, way too plain, and way to young/ green. But 2 years later I can say that he is the perfect horse for me. I love him with all of my heart even if initially it might have been a struggle. It really depends on what you want and how fast you want it I guess. I tried a boat load of duds and then just really liked Houston. Not saying there should always be some magical connection with every horse but you have to decide the things you are willing to compromise on and the things you are firm on. No one can decide that but you ultimately. I personally have shopped with and without a trainer. I found Houston without a trainer and got very lucky but it easily could have gone the other way. Interested to hear about how things go with the little mare! Thanks for your insights Hillary! I do have to be the final decision maker don't I? Rats! 1) Trust your trainer. Best thing I did was work with a pro who has bought and sold a LOT of horses. 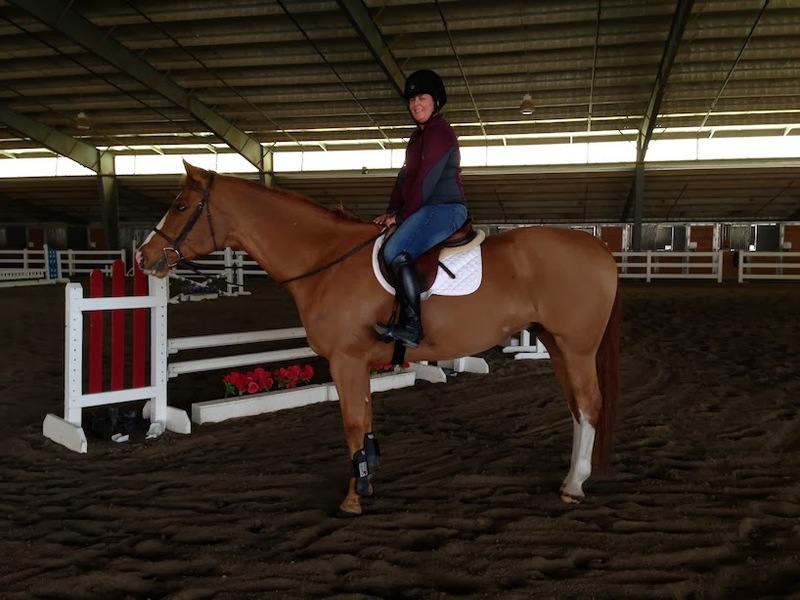 I rode with her for a year and half before buying, and felt confident she knew what I needed. 2) If you want to make spaghetti, don't buy steak or chicken or bread. You have to buy noodles, sauce and meatballs. Weird analogy, I know, but the point is if you want to show hunters, buy a hunter. Don't buy a 14.2hh Halter-bred Quarter Horse or a hot 2 year old off the track. You will save yourself a lot of time, effort and heartache if you buy what you want and don't try to totally change an animal to fit your goals. Thanks Tracy! I love nugget #2- you're totally right that trying to force a fit is not ideal in the slightest. I always do try to keep an open mind- there a very small Palomino QH at shows in the AA divisions at our A shows and wins! I will reach out via email- while I know the final decision is mine- it's always helpful to talk through with someone who has been there and done that! O was visiting my barn for some training and an attempt by her racing trainer to be sold. She was in crappy shape and very green. I did not like her rough gaits and awkward looks. However, a few lessons down the road I couldn't ignore how much fun she was and how hard she tried at everything. Not to mention I could trust her to not be stupid. I wasn't even looking for a horse at the time! Final decision was made because I heard she was also happy going western and my husband could hop on her if he wanted. I love how she just fell on your lap! A horse that you can just have fun on is the best! Horse shopping is hard. My 2 cents is that don't trust your trainer blindly. My previous trainer found me a FANCY horse within my budget, and on paper he was great... but I had a bad gut feeling about him. That never went away, and he threw me off multiple times. I ended up being very scared of him and had a huge confidence problem riding fo ryeras. It wasn't her fault, but I'm saying to listen to your gut. Thanks Lauren! Great advice! It's hard to find that balance between trust and gut but you're totally right. Blindly following is not the right answer. I sent my trainer a list of questions we need to discuss on Saturday to get a better understanding of how we will fit into the program with as green as she is! L and I ride with the same trainer, she knows her stuff and is good period haha! I trusted her and her opinion.. when I was shopping for Henry- she said a MILLION no's but I was ok with that and told her I was falling in love with nothing haha! I had a price range and knew I wanted something green that had potential. She actually never saw Henry in person, just video. I guess it was a bit of a gable- he came off the track with a couple months under saddle with an ammy who gave him a nice stopping problem that we didn't know about. It was hard work but we worked through it and I feel like I have a nice horse now- I wouldn't trade him for the world and am SO glad that hard hard work is behind us- not we just have to keep up on everything we worked for ha! There is something so rewarding about a project! I'm so happy that the hard work paid off! Henry is awesome! My aunt had to sell her bald little skinny Quarter Horse because she couldn't afford to feed or medicate him anymore. :) She begged my mom to help me out and let me take him, mom gave in and she gave me Red for an early Christmas gift. He was stubborn, lazy, skinny, a diamond in the rough, but he was mine and I loved him regardless! I went out Thursday and hopped on, walked around, and watched the juniors in their lesson. That's what owning a horse is about! Enjoying just being together! What an exciting Christmas that must have been! All of mine fell into my lap when I wasn't looking. Two were free and the third and forth very cheap. I have never in my life horse shopped, as in looking for a horse and trying some.